Tickets go on sale 2/1 through ticket link. Winter is here there's no doubt about that! What better way is there to warm up than joining 2 Towns for the comfiest party of the winter?? Don't be a victim of FOMO! 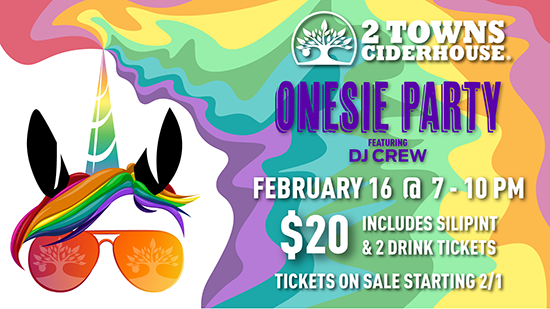 Pull on your snuggliest onesie, grab a cider & dance the night away with us in our cellar to the bumping tunes of DJ Crew! Tickets are non transferable except at the discretion of 2 Towns Ciderhouse. Refunds are available for tickets based on how close to the Event the request is made.